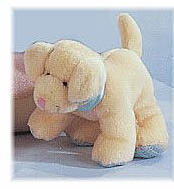 Li'l Pups - 5" Squeaker puppies trimmed with waffle fabric accents. All RUSS Baby Plush are machine washable (mild detergent/cool dryer), non-flammable, non-toxic and non-allergenic. Size (inches): 4.33" X 2.36" X 3.15"
More Photographs - Li'l Pups - Squeaker Puppy - White/Blue - 5"
End of More Photographs - Li'l Pups - Squeaker Puppy - White/Blue - 5"